The UNFCCC is one of the most important governing bodies that facilitate the discussion of climate change on an international level. With its goal of stabilizing greenhouse gas concentrations to a level that would not bring catastrophic changes to the Earth’s ecosystems, the UNFCCC takes a multilateral approach, establishing institutions, intergovernmental processes and assigning nations with specific responsibilities of reducing their impacts upon the environment (UNFCCC). In order to help nations with designing strategies and developing mechanisms to adapt and mitigate the effects of climate change, the UNFCCC has established a financing mechanism with multiple operating entities, mainly the Global Environment Facility (GEF) and more recently, the Green Climate Fund (GCF). The Global Environment Facility was established in 1991, as a response to a growing need of a governing financial entity, and provides funds to developing countries and countries with economies in transition to meet the requirements of international environmental conventions and agreements. Not only does the GEF serve as an operating financial entity for the UNFCCC, but also other conventions such as Convention on Biological Diversity (CBD), the Stockholm Convention on POPs and the UN Convention to Combat Desertification (CCD). The GEF fund is replenished every 4 years, with current contributions from 39 countries, totaling $4.43 billion (GEF, 2017). The second operating financial entity for the UNFCCC, the Green Climate Fund (GCF), was established in 2011 under the 15th COP in Copenhagen. The GCF focuses specifically on funding developing countries, especially highly vulnerable communities, in order to help them develop enough infrastructure to limit greenhouse gas production, mitigate and adapt to the effects of climate change. The goal of the GCF is to raise $100 billion annually by 2025, in order to have the adequate resources to fund developing countries (UNFCCC). As of now, however, the number of resources mobilized has only reached $10.3 billion (Figure 1). Nonetheless, the GCF has already invested in many programs that help increase the climate resiliency of vulnerable communities. For example, the state of Odisha, India, suffers from extreme food and water insecurity due to irregular floods and monsoons. The GCF has funded a project to install 10,000 groundwater recharge shafts for the vulnerable communities, effectively increasing the livelihoods of 5.2 million beneficiaries. In Vietnam, where coastal communities are vulnerable to tropical storms, the GCF has invested in infrastructural development, rebuilding houses and rehabilitating coastal mangrove forests to create storm buffers, increasing the livelihoods of 30 million beneficiaries (Green Climate Fund, 2017). In Nepal, the GCF funded the government $2.7 million dollars to develop a National Adaptation Plan in order to identify medium and long-term adaptation needs and strategies to address these needs (Green Climate Fund, 2016). Figure 1. 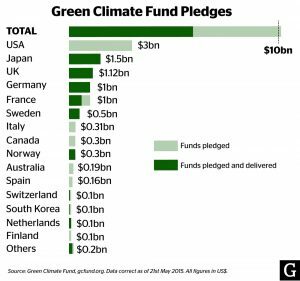 Contributors to the Green Climate Fund. As nations continue to cooperate and develop long-term strategies to mitigate and adapt to the impacts of climate change, it is important that these operating financial mechanisms remain in place and receives continued contributions. Without the resources provided from the GCF, developing countries, especially highly vulnerable countries, will not have the resources to make the transition to a clean economy within a limited timeframe, or develop a strong support infrastructure to communities that will be affected by the impacts of climate change.